Nicole In Your Neighborhood highlights local spots in the Indianapolis area. I'll share what's unique about the local business, what you should know before you go & why you should add it to your list of places to visit here in Indiana! PLUS, I'll always include a FOLLOWER PERK for YOU. Andrew, Colin & Matthew LOVE "Carter's Play Play!" Westfield, Indiana - Carter's Play Place is an AWESOME spot for the kiddos. I heard about Carter's Play Place from working in the news business but never visited until I was looking for a new spot to take the boys during this LONG & COLD Indiana Winter. Carter's Play Place understands how to make it easy and fun for families AND there's a mission behind this business. Here's a photo of 9-year old twins Carter and Melanie. Carter is non-verbal autistic, diagnosed just after his second birthday. The twins are epileptic. 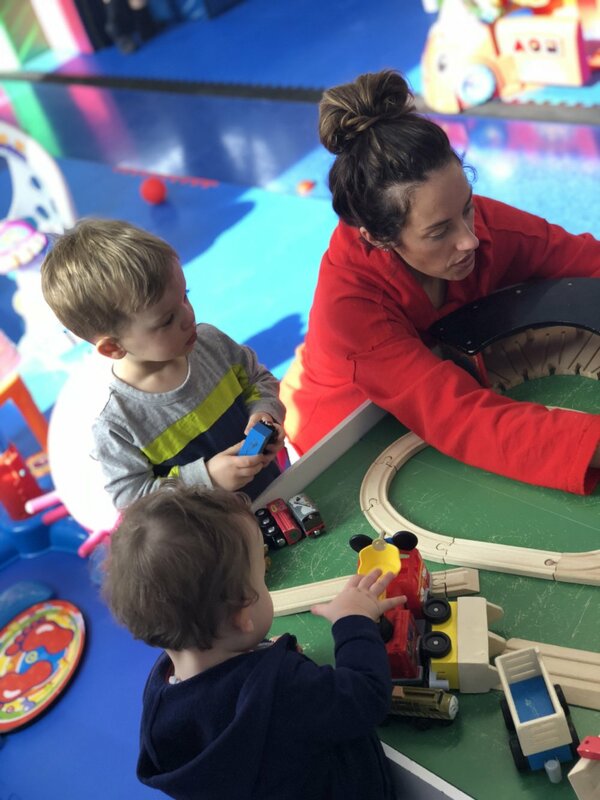 Carter attends applied behavior analysis (ABA) therapy full-time and also receives Occupational Therapy right here at HIS Play Place twice a week. His dad, Adam, tells me Carter is a big fan of YouTube and loves to watch his favorite cartoons. Carter is generally a happy-go lucky boy full of life! Back in 2015, Adam felt that our community lacked a true recreational center that specifically serves special needs children, as well as neurotypical children. Carter's Play Place is an inclusive play place for children with all abilities. It's very sensory-focused (which I love!) and there are tons of toys, a trampoline, slide, zip line, swings & a full-kitchen area to bring your food and snacks while you play all day! Carter's Play Place is a safe and clean, too. Andrew, Colin & Matthew LOVE going to "Carter's Play Play!" And, I love that we are supporting an organization that is impacting families POSITIVELY here in Central Indiana. Carter's Play Place is open 7 days a week for kids of all ages & abilities. Visitors can buy a single visit pass for $10 (sibling discount available) or 6-pack pass for $50. Waivers are signed to play. Kids under 2 are free with a sibling. Visitors can bring their own drinks & food to use in the kitchen-area. There is a highchair available for babies. No food restrictions. Carter's Play Play is now offering Occupational Therapy (OT) services including Sensory Integration, Fine Motor Skills (e.g., handwriting), Self Help Skills (e.g., dressing) & Feeding Skills. Call for a one-hour evaluation ahead of first appointment. Monthly & Annual Memberships are also available. Carter's Play Place is now accepting new Occupational Therapy (OT) clients, including a no wait list for Medicaid families. Their Director of OT, Martha Burrows, has 30 years of OT field experience including the official Sensory Integration training at the Ayers clinic at USC. Adam, the founder of Carter's Play Place, also tells me their programs aren't just limited to sensory intergration OT. They've got a list on their website of all the services they offer to children. This NEW Occupational Therapy component for Carter's Play Place will (hopefully!) keep the cute, impactful play spot open for the long haul. The fact that I know I'm paying to help support special needs' families is money well spent! We tend to go in the morning to run around and play for an hour or two - then we eat a snack (sometimes our lunch!) - and, play a little more ... the boys are WORN OUT! If you want, you can come back in the afternoon since your day pass lasts the entire time they are open that day. I also love that they are interacting with other children (it's a great meet-up for playdates!) and that there are options for ALL children. Andrew, Colin & Matthew have different interests so it's great to find a play spot with different toys and physical-activity options that statisfy all three of these little stinkers! FOLLOWER PERK: I teamed up with Carter's Play Place to offer my followers a PERK! Get $10 off a six-pack (regular price $50) until June of 2018. When you go, tell them you want the Nicole Pence PROMO CODE. That's it! The play packages do not expire and are transferable, which means they aren't limited to one child. One other note, Carter's Play Place also has a non-profit charity called Carter's Crew. Carter's Crew's mission is to provide financial assistance to local special needs families in the form of annual memberships to our gym and respite care. They've given away 60 local special needs families annual members, AMAZING! Learn more about Carter's Crew HERE. Check out Carter's Play Place on their website and use the PROMO CODE Nicole Pence for a discount to play! Visit their Facebook , Instagram & Twitter pages as well for more information. Let me know if you go, people!